Insects and arachnids are included in the phylum Arthropod, the phylum containing more animal species than all other phyla combined. Arthropods share a number of characteristics, including segmented bodies and legs. Like most arthropods, insects have compound eyes; arachnids, however, have simple eyes. Both see what they need to see. Spiders are arachnids, but this class of animals includes more than spiders. Mites, ticks, daddy longlegs and scorpions are also included in the class. Arachnids vary widely in size and can be hairy, such as tarantulas, or hairless, such as ticks. Insects include cockroaches, beetles, bees and butterflies, all of which have three body segments, antennae and compound eyes. In addition to compound eyes, many insects have a set of three ocelli, or simple eyes, on their heads. Instead of compound eyes, arachnids have simple eyes, meaning each eye has a single lens to receive and process visual information. Different arachnids have different numbers of eyes. For example, hooded tick spiders have no eyes, while harvestmen have one pair of eyes, sitting on stalks. Some scorpions have seven pairs of eyes and some spiders have three pairs of eyes. Despite all these eyes, many arachnids don't have great vision, often just detecting light or general shapes. Air movement and scent fill in the information they're missing. Ommatidia are visual receptors. Arthropods have multiple ommatidia, each containing a lens, a crystalline cone, pigment cells and light-sensitive visual cells. The visual cells are arranged in a round pattern, similar to a sectioned orange. The pigment cells separate each ommatidium, as well as focus incoming light on the ommatidia to trigger nerve impulses. Each ommatidium receives and contributes information about one tiny portion of what's in view. 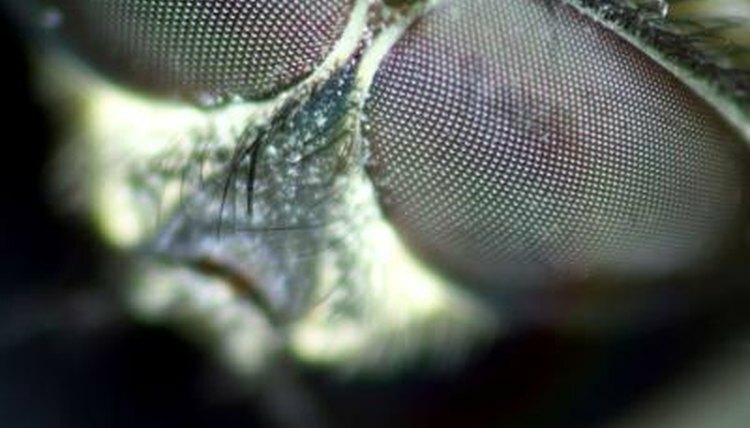 One compound eye can have thousands of ommatidia, giving the insect a mosaic-like image, or a pattern of dark and light dots comprising an image, like a photograph. Different insects have different compound eyes. Because of those big, bug eyes, insects have a greater field of view. As well, they can differentiate color and dark and light. They do sacrifice some detail, however. For example, a human eye at three feet can see object details, where an insect can only see the outline of the object. Compound eyes are good motion detectors, as well -- in fact, insects respond better to moving objects than stationary ones.